...and oh how happy she was to see the sun. 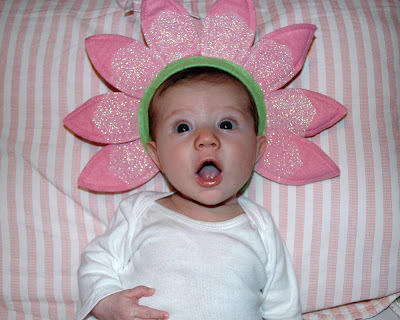 However, the flower was really a little girl named Ava who dreamt of being someone's flower girl (hint, hint Owen). But whilst waiting, began perfecting her kisses for when she would someday herself be the bride and live happily ever after. This was too, too darling for words. 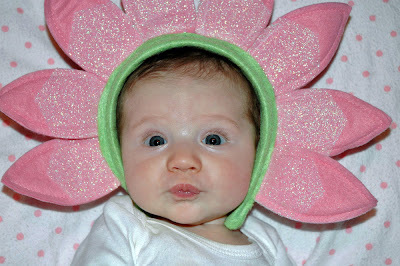 Where did you get the little flower headband? I love the picture where her eyes are so big. 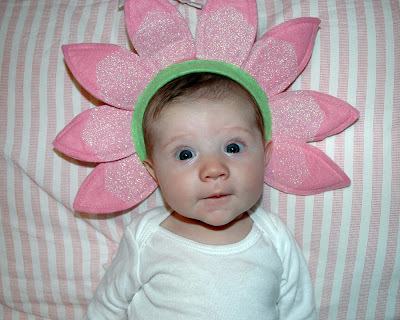 She is the cutest little flower ever and will make the perfect flower girl. She will probably be walking around and talking by the time she'll need to be a flower girl at the rate this couple is going. Thanks for the great pictures! She could me a flower girl with me! Or do you think Im to old? She looks really cute! She is too cute...and I remember Klous being like that for tummy time...not real sure what they're supposed to do!! I love the pictures in the headband...her little faces are so cute!!! I refuse to say cute so I will say-twee. That story was so twee. Um....hopefully our baby will be as cute as yours. Actually, Krista took the pictures. Hints? What hints?